I called this a cheesecake, but it’s not exactly true, because there’s no baking in this recipe. This turns out to be brilliant: it comes together quickly, can be made ahead, and is the kind of thing you can imagine making in the non-oven months, like July. I’ve made this cake as pictured, and also in paper-lined muffin tins for individual servings, and both worked well. The filling is ultra-creamy and not too sweet, and the tang of the marscapone does a nice job of setting off the heat from the ginger. Grease a springform pan, and then dust it with sugar the same way you’d normally dust with flour. Tap out any excess. Crush the gingersnap cookies. It’s easiest to do this by whizzing them in a blender or food processor, but I’ve also done it by putting them in a bag, closing it carefully, and then smashing the heck out of them. Ideally, you’ll get uniform, fine crumbs, but it doesn’t matter too much. 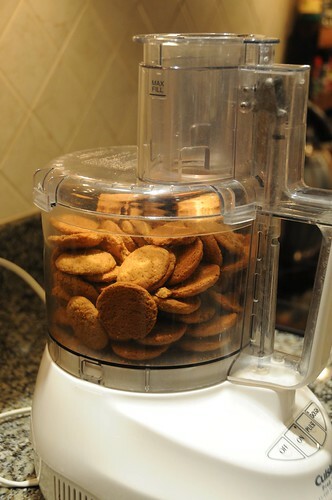 Melt the butter in the microwave or on the stove top, and then add it to the gingersnaps. If you used a really big box, you might need a bit more butter to evenly mix with the crumbs without dry spots. Press a third of the mix into the bottom of the springform. Put the cream cheese in a bowl. You’ll probably want to do this with a mixer — I’ve used both stand and hand mixers successfully — but you could also do it with strong biceps! If you choose the latter option, make sure your ingredients are softened before use. Whip the cream cheese until smooth, and then add the yogurt, sugar, and vanilla. Add the marscapone and mix, then the cream. Chop the crystallized ginger as finely as you reasonably can, and stir it in to the filling mixture. 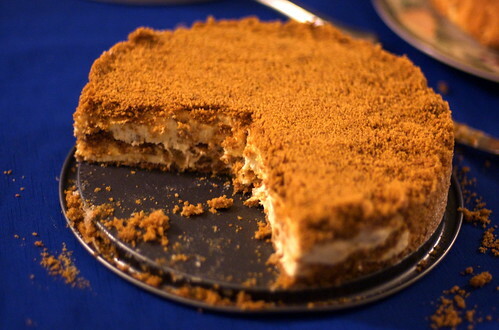 Carefully spread half of the filling over the bottom crust. Be careful not to make holes in your crust when you do this; using your fingers or a silicone spatula is probably easiest. Sprinkle half of the remaining cookie mix over it, as evenly as you can, then top with the remaining filling and finally the last of the cookies. Refrigerate this, covered with plastic wrap, for at least a few hours; overnight or even 24 hours is fine. After this, you should be able to remove the outside of the springform and carefully slice.